Comcast has the largest market share in the US in both Cable TV and Broadband Cable Internet services. Many of their million subscribers look into replacing their modem or router/modem gateway provided to them by Comcast/Xfinity with their own device. In this article we’ll show you the best Modems and Routers compatible with Comcast in case you want to buy your own equipment and avoid the monthly cost. Buying your own device will save you a lot of money per year in rental costs because as you know Comcast (like other cable providers) charges a monthly fee for using their provided modem/router. Fortunately, Comcast/Xfinity supports third party Internet equipment (i.e standalone cable modems or combo router/modem wifi gateways) and even provides online information about all approved models. However, if you go through the list of compatible modems and routers you will find more than 70 different equipment without knowing which one is the best for your specific Internet speed tier. Combo Modem/Router Gateway (Cable modem and WiFi Router in the same box). Standalone Cable Modem (this option requires a separate WiFi router). Minimum DOCSIS 3.0 cable standard. Currently 3.0 and 3.1 are the most widely supported cable protocols and ISPs don’t support lower protocols. Minimum 16×4 bonded cable channels. Its rumored that Internet Service Providers (ISPs) will stop supporting smaller channel numbers (e.g 8×4) in the future. Broadcom chipset instead of Puma 6 chipset. Modems with the Intel Puma 6 chipset (processor) have several bugs including speed latency and lags. On the other hand, Broadcom chipset is reliable and stable (that’s why we mainly recommend Motorola and Netgear products below). Future Proof. Its better to buy a modem that supports Internet speeds above your current Xfinity Internet service in order to have room for expansion in the future. At least AC1600 WiFi speed (i.e 1600 Mbps max). This is important to support newer technology demands such as HD and UHD video streaming, Internet of Things, Smart Home devices etc. Let’s now see a brief review of the top combo modem/router models we are recommending for Xfinity Internet service. These devices are more expensive than normal standalone cable modems but you will not have to buy a separate WiFi router since this function is already embedded in the box. Since you will be saving from rental fees, you will cover the initial cost in a few months. This Netgear model is mature, cheap and reliable. It will work great with Xfinity speeds of Performance Starter, Plus or Pro (up to 150Mbps). You’ll notice streaming HD videos is much faster with this device. Many users noted that the Netgear was extremely easy to set up and quite straightforward to use. One hardware feature I like with this model is its USB port (USB2.0) combined with ReadyShare app which allows you to share media files over the network or use it as backup storage device. You can buy a 256GB USB flash drive, connect it to the router and use it as backup storage for the whole family. Managing your router is made simpler with the Genie mobile app that grants controls such as monitoring, connecting and even sharing files. All in all, the Netgear C6250 is a very good choice for modest bandwidth requirements. Low Cost for a combo device. Allows you to share files across different devices with the USB port. Features a Guest Network as well as WPS. Motorola Internet devices are mostly equipped with the Broadcom chipset which is reliable, secure and high-performance. Broadcom provides also security against Denial of Service attacks which is a plague for Internet connected devices. The MG7550 is ideal for Comcast Xfinity Blast Pro (up to 250 Mbps) although it can support service speeds of up to 375Mbps, so it is future proof in terms of speed. With Dual-band AC1900 WiFi speed you have enough bandwidth to support multiple devices in the house. Use the 2.4 Ghz band for the smartphone devices and the higher-speed 5Ghz band for the laptops. The 2.4 Ghz band has longer coverage which is needed for mobile devices. Also, the 5Ghz band will provide better speeds for the more demanding laptops of the family. Very good wireless coverage. A user reported very good coverage in 3100 sq.ft brick house (two floors). 1900 Mbps (max) Dual band WiFi. Increases speed and range of the signal with power boost. Close to this price range, you can find a higher-end model such as the Motorola MG7700 (see below). This is another Comcast supported Motorola option. Its ideal for Xfinity Extreme Pro (up to 400 Mbps) and also has room for expansion in speed since the manufacturer recommends this model for service speeds up to 650 Mbps. The Motorola MG7700 gateway includes a built-in AC1900 dual-band wireless router that includes a firewall and Power Boost capability. This feature amplifies the WiFi signal for larger coverage in the house (users reported very good coverage in 3400 sq.ft area and even on the 3rd floor of the house). Regarding hardware ports, it includes 4 Gigabit Ethernet Ports to help you connect home wired devices such as your smart TV, desktop computers, gaming consoles etc. Overall, this modem/router combo creates a more reliable and stable connection with users reporting enhanced performance in their network. Its design allows you to minimize shelf space and helps improve cooling that elongates the life of the product. Very good wireless coverage. A user reported complete coverage in 3 floor house with 3400 sq.ft area. High-speed browsing and download speeds. At the time of this writing, the Netgear C7800 is the ONLY Comcast approved combo device (modem + router) for Gigabit Xfinity service. 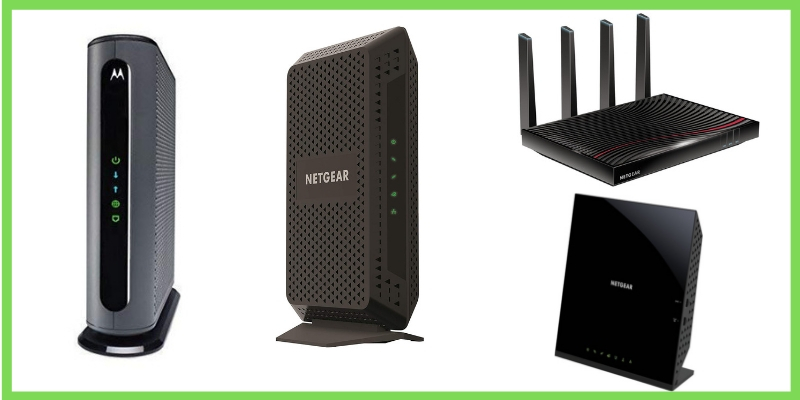 This model is a highly effective all-encompassing solution to your internet needs that includes a DOCSIS 3.1 cable modem, a high-performance AC3200 WiFi router and a Gigabit switch (all on the same device). Being a DOCSIS 3.1 modem, it can work on Xfinity Gigabit (1000 Mbps) service. Actually, only DOCSIS 3.1 protocols are supported on Gigabit cable services (this is true for all ISP providers). Having 2 USB ports allows you to connect portable Hard Disks for storage (or USB sticks) or even printers for printing over the WiFi network. Users found that opening new websites was like turning the pages of a book with the high-speed capabilities. Also included is incredible coverage which allows you to access the internet from every nook and corner of your home. All in all, the Netgear C7800 is perfect for those with larger sized properties who need excellent coverage and exquisitely fast speeds. Future Proof supporting both DOCSIS 3.0 (32×8) and DOCSIS 3.1 for Gigabit Internet. Perfect for lag-free online gaming, 4K and UHD video streaming. Includes 2 USB ports and a Gigabit wired switch. Four amplified and active external antennas for great WiFi coverage. It’s the only combo model supported for Xfinity Gigabit service. This category includes devices which are only cable modems without any WiFi router capabilities. Ofcourse you will need to get a separate WiFi router to share the Internet line with multiple home devices. In my opinion, having a separate cable modem and WiFi router is a better option compared to the combo devices. If for example the cable modem or WiFi router breaks down, then you will have to replace only the device that is broken without throwing away the whole combo appliance. Moreover, if you subscribe to a higher speed internet service, then you just need to buy a faster cable modem without having to replace the whole combo appliance again. The pros of having separate devices are much more than the cons in my opinion. NOTE: An excellent WiFi router that will work great with Comcast (and with any other ISP actually) is the Netgear Nighthawk X4S (R7800). This is a value-for-money device that supports the newest WiFi Wave2 802.11AC standard with powerful features such as Beamforming, MU-MIMO etc. This is a best seller product in a very low price. Great choice for lower Xfinity tiers like the Performance (Starter, Plus, Pro) of up to 150 Mbps. Since this is a 16×4 modem, it can actually support up to 300Mbps service speeds therefore we recommend this budget device even for Xfinity Blast Pro of up to 250 Mbps. The CM500 has been in the market since 2017 and proved its reliability and stability. It is equipped with a Broadcom chipset and unlike the Puma 6, which empowers the CM700, it works flawlessly with the DOCSIS 3.0 protocol. Does not show stats on the web interface. This is one of my personal favourites. With a 24×8 bonded channels, its great for Xfinity Extreme Pro – up to 400 Mbps (although it is future proof since it can support even higher speeds). The Netgear CM600 is one of the highest-ranking cable modem devices in terms of customer feedback. Take a look at some of the popular online forums (like dslreports forum) and you will find raving reviews of users for this particular Netgear device. Users love the fact that the CM600 is compatible with almost all providers. Furthermore, users remarked that the multiple downloads and upload channels make it a great choice for heavier internet uses. Overall, the CM600 is a great option which is compatible with multiple service providers. Not only is it fast and easy to use, but it is great value for money as well. Excellent customer reviews for this model. Compatible with multiple service providers. Includes power and a reset button. Reliable with its Broadcom chipset. Best value for money choice. The status LEDs are awkwardly placed on the box. We have compared and reviewed this modem in our article about the best DOCSIS 3.1 cable modems currently available. Its undoubtedly the best modem for Gigabit Internet speeds. Manufactured by Zoom Telephonics, a USA company, this is a robust and great choice for Gigabit service of Xfinity. Having 4 Gigabit Ethernet ports for LAN connections (although 3 of the ports are hidden behind a plastic label), it can even support more than 1 Gig speeds for future expansion if needed. A unique feature that many users loved is the Active Queue Management mechanism which allows the system to prioritize packets. As a result, you’ll find that the modem delivers high-speed internet with faster loading websites and more responsive online gaming and video streaming. Another exquisite feature is the Full Band Capture technology which is suitable for rural areas or areas with weak signals. So, if you want a modem that lasts long in terms of durability as well as technology, there’s none better than the Motorola MB8600. Future Proof for years to come. Includes a priority management system. High-calibre manufacturer (Zoom Telephonics and Motorola). Requires ISP to upgrade the device firmware if needed (actually this is valid for other modems as well but we had to write a con ). If you have Xfinity Gigabit Internet and Voice service, the above Netgear CM1150V device is the newest kid on the block. It first appeared in the market at the beginning of 2019 and supports DOCSIS3.1 which is required for getting cable Gigabit speeds. It has 2 telephone ports and 4 Gigabit LAN ports but no WiFi (you will need a separate wireless router).